The Ping An rice terraces were named the Ping An Village, a place in Longsheng County about 2 hours from Guilin in Guangxi Province in China. About 500 Zhuang ethnic families living there. When people say Longji (Dragon's Backbone) Rice Terraces, usually they mean Ping An rice terraces which are called 'The champion of the terrace world'. With it beautiful scenery and landscape the Longji Terraced Fields attracts more and more tourists nowadays. This image belongs to the travel and nature stock photo library. This stock photo of Ping An Rice Terraces is available for licensing for commercial and editorial uses including websites, blogs, books, magazines, brochures and advertising. Restrictions may apply for images which contain third party copyrighted material or sensitive subjects. Photos of artwork are for editorial use only. 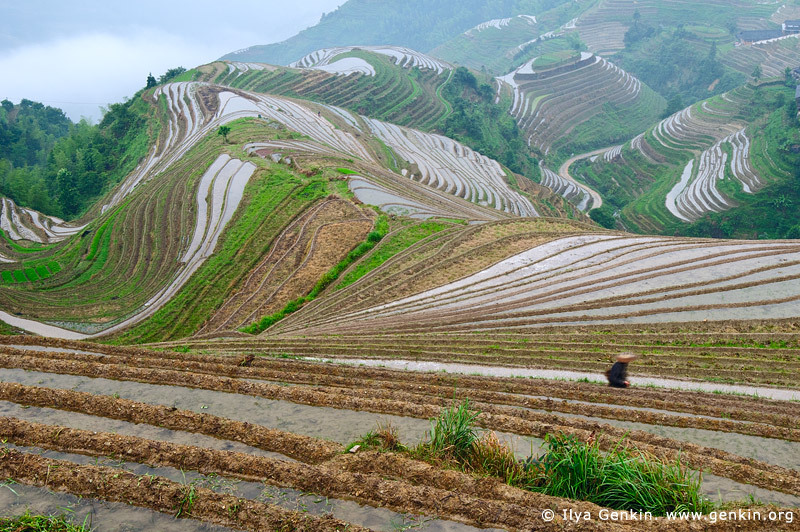 This image id CHINA-LONGSHENG-0007 of Ping An Rice Terraces, is copyrighted © by Ilya Genkin. This is not a public domain image.